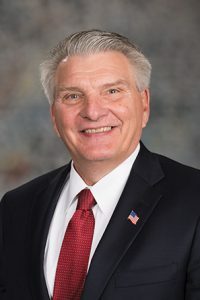 LB944, introduced by Speaker Sen. Jim Scheer of Norfolk at the request of the governor, makes adjustments to appropriations for state operations, agency and school aid and construction programs in the current and next fiscal year. The bill contains an across-the-board reduction in general fund appropriations to many state agencies and operations budgets of 2 percent in fiscal year 2017-18 and FY2018-19. The University of Nebraska, state and community colleges will see a 1 percent reduction in FY2018-19. Reductions in state aid—except for community colleges—is retained at 4 percent in FY2018-19. Among other provisions, the bill also provides $55 million to the state Department of Health and Human Services to cover increased child welfare costs and $15 million to offset reductions in the federal Medicaid match rate. A provision included in LB944 prohibits federal Title X funds from being paid or granted to an organization that performs, assists, provides directive counseling in favor of or refers for abortion services. An otherwise qualified organization that is affiliated with, but objectively independent from, such an organization—which the bill defines as legal, physical and financial separation—is not disqualified from receiving funds under the bill. The provision also prohibits the referral of a patient to an abortion service, which the bill defines as the act of recommending a pregnant woman to doctors, clinics or other persons or entities for the purpose of obtaining an abortion. Neutral, factual, nondirective information about prenatal care and delivery, infant care, foster care, adoption and pregnancy termination in an emergency situation in accordance with state law does not constitute an abortion referral under the bill. LB944 passed on a 38-6 vote. A number of fund transfers and changes to transfer provisions are made by LB945, also introduced by Scheer at the request of the governor, and passed 41-4. • transfers $200,000 from the Affordable Housing Trust Fund to the Lead-Based Paint Hazard Control Cash Fund. LB946, also introduced by Scheer, changes provisions relating to the state’s Cash Reserve Fund. The bill transfers $100 million from the Cash Reserve Fund to the General Fund. It reduces by $2.3 million a transfer from the Nebraska Capital Construction Fund due to the lower cost of the Central Nebraska Veterans’ Home project. The bill also changes the timing and individual transfer amounts to the Nebraska Capital Construction Fund related to the heating, ventilation and air conditioning project at the state Capitol Building. The bill passed on a vote of 40-5. LB950, introduced by Business and Labor Committee chairperson Sen. Joni Albrecht of Thurston, provides for payment of claims against the state. The bill, passed 47-0, includes tort and workers’ compensation claims totaling $2 million, along with several agency write-offs totaling $978,000 for various uncollectable debts.